Several thousand Danish citizens have come together to pay for an advert in UK newspaper The Guardian bemoaning their government's intention to run a campaign highlighting new laws designed to deter immigrants and refugees. Last month the Danish government introduced a bill which, in the words of a press release from the country's Immigration, Integration and Housing Ministry, would make it "less economically attractive to seek asylum in Denmark", and to "give newly arrived refugees and immigrants a greater incentive to work and become integrated in Danish society". The law could be approved by the Danish parliament by the end of the month and would then come into force on 1 September, according to a spokeswoman for the ministry. Integration minister Inger Støjberg has announced the government's intention to run an international campaign with adverts in foreign newspapers advising would-be migrants and refugees of the changes. The ministry spokeswoman said it was too early to give further details about how this might work. A full-page ad at the start of the international news section of yesterday's Guardian says: "We're not all like minister Støjberg and the rest of the Danish government. "Many of us are bidding refugees a warm welcome. And many of us want to help those who are fleeing torture, bombs and prosecution." The ad's background includes the names of those individuals who helped pay for the ad, which various media have suggested will have cost around 200,000 Danish krone (£19,000). These donors are from among the more than 19,000 followers of a Facebook page called 'Velkommen til flygtninge – Nej til Støjbergs skræmmekampagne' ('Welcome to refugees – No to Støjberg's scare campaign'). The ad concludes: "So, dear fellow human being, there is another voice in Denmark – a voice representing peace, solidarity and human decency. 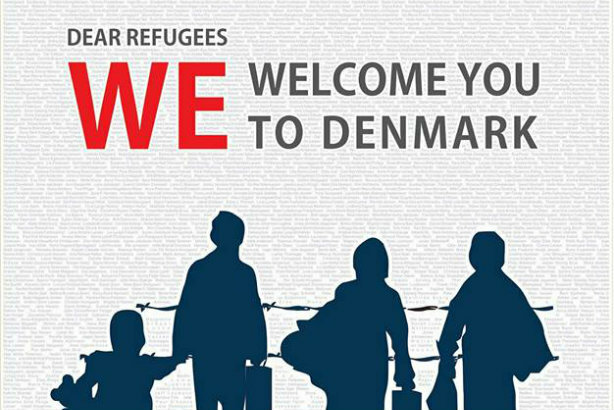 That's why we extend a warm welcome to Denmark and denounce the government's scare tactics." Separately, UK politicians have also been criticised for their reaction to migrants attempting to cross the Channel and the Mediterranean respectively. Foreign Secretary Philip Hammond faced a backlash last weekend after referring to "desperate migrants marauding around the area", following in the footsteps of his boss Prime Minister David Cameron who was criticised for referring to a "swarm" of migrants.